Who likes Free Stuff? I do. Let me preface this post first by enlightening everyone to a term I have… more like a group of people I turn to when I need information. Nerds on the Internet. There are all kinds of Nerds on the Internet. A lot of them influenced some of my other posts that you will see soon regarding photography, food, the general DIY world. The particular Nerds I will touch upon today are the coupon nerds. Sitting on the couch at some odd hour of the night inflicted with one of my respiratory infections this winter, I saw a show called Extreme Couponing. 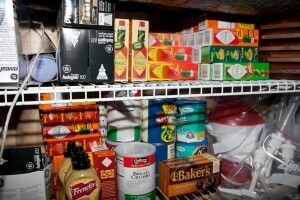 These people are psychos – they take their grocery bills down hundreds of dollars by timing deals and using coupons. The word extreme does not even begin to describe some of these folks. It did however, spark my interest. Let’s admit it – times are tough, if you can save money, why not? I know, I’ll probably get flamed for this post, but you know what, I’m saving cash money in my pocket so flame away. I started to read around what the Nerds were up to, with the goal of seeing if I could save some cash on things I know I would buy and use anyways. (WARNING – NERD ALERT) There are forums where the masses gather to discuss good deals at stores, and how to combine those deals with coupons to get things for very cheap or free – the site I have been reading is called A Full Cup (AFC for short). Once you sift through all the crazy ladies, funny acronyms, and the extremists, there are some good deals to be had with coupons. Each store will have a thread each week when the ads are released, that explain what you can find free / cheap / good deal in the upcoming week, and what coupon to use along with it to get a better deal. All it takes is about 20 minutes of reading around Tuesday or Wednesday (when the ads come out), and you never know, you might see something free / cheap that you can stock up on, or a good deal on something you were going to buy anyways. I’m not awake enough early to get the Sunday paper, nor do I feel like clipping coupons, so I found that you can actually pay for someone else to clip coupons and mail them to you. I’ve used the Coupon Clippers a few times so far, there are others, just google it. At first I thought paying for coupons was insane, until I realized, I’m gonna buy the stuff anyways, if I shell out 15 cents I can save a dollar – why not. You end up in the black at least 1000% by going this route in the end. Also, you can get dozens of coupons if you plan on stocking up. Some of the deals require you to get the shopper’s card at the store, no big deal. A lot of coupons are also printable from the Internet – most limit 2 per computer, so if you have more than one computer, print away. Tabasco sauce. $3 for some small mountain of 75 cents off Tabasco sauce coupons. Wegmans has it on sale for 99 cents, or regular price of $1.39. They double 75 cent coupons to 1.50, so they actually paid me to take Tabasco sauce. I have a small mountain of it, check the picture. I go through this stuff like it’s my job since I douse all of the bland diet frozen dinners I eat with it. Laundry soap. Wegmans has the laundry soap I’ve been using for $2 a bottle. Paid 60 cents for $1 off 2 bottles. $1.50 a bottle, have enough for probably another year. Dryer sheets and fabric softener. 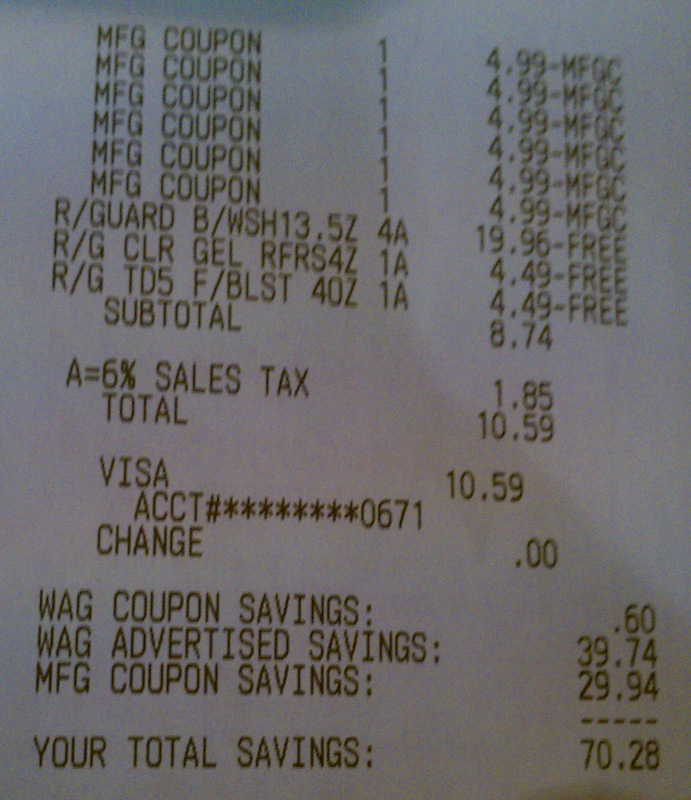 Paid $5 for 20 $3 off Gain coupons. They are $3.26 at Walmart. 26 cents for dryer sheets and fabric softener? Ok.
Snacks. This one takes the cake. The Nerds had a post that certain snacks you buy at Rite-Aid in the month of February give you a $1 coupon for each one you buy, off your next purchase. These snacks went on sale for 4 days at the end of the month for $1. So, you go in, get 10 snacks, it prints off 10 $1 coupons off your next purchase. Well, you go right back in, or to another store, get 10 more, pay with the coupons, and it printed off 10 more $1. Free money. I now have a small mountain of snacks for the summer time, that I’ll be able to stock up my friends at the drag strip with. All it cost me was an hour and a half of my afternoon. 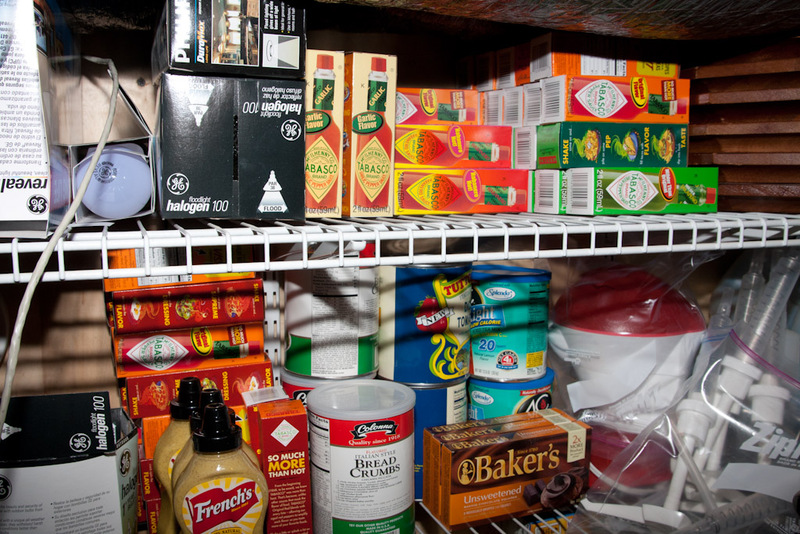 See the Tabasco and Mustard? Yeah, that was free. I’m sticking to my goal, getting deals on things I know I’ll buy anyways, or can use. If I can’t use it, I’ll be giving it away to charity, so either way, someone is making out good. 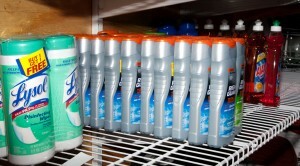 Some of this stuff I’m going to pass on the deals, I don’t need a 40 year supply of laundry and dish soap. Any problems so far? Nope. Most cashiers are actually pretty impressed at how much you can knock off a grocery bill. Others are not too surprised as I’m not the only one around here that’s psycho and reads AFC, so they are used to people coming in and grabbing a lot of one item and just so happen to have a pile of coupons. 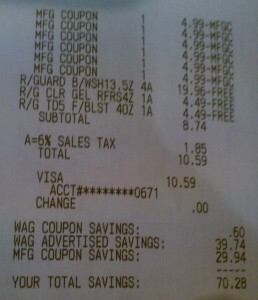 Do what I did, have a read, see if you can save on everyday stuff you’ll buy anyways. Put the cash towards more important things, like beer and vacation.